When writing this I often struggled to find adequate language to describe the perspective I was trying to lay out. I have sometimes used language that might be interpreted in a more limited way that it was intended. Here are a few definitions of how I use certain words in the dissertation. “Information” - The process of things coming into form through intention, literally in-form-ation. "Thesis" - comes from the Greek θέσις, meaning "something put forth", and refers to an intellectual proposition. My thesis is summarised in the Abstract and at the start of each Chapter. “Universe” - spelt with a capital U throughout to denote my experience of it as a living entity not just a rational scientific concept (which the word with a lower-case “u” tends to connote). Ever since humanity moved out of hunter-gatherer ways of living and agrarian neolithic cyclical ways of life and into industrialisation, we have seen ourselves in the context of linear space-time (Wilber 1996). This linear perspective grew in dominance and lead to evolution theory. It fuelled our quest for growth and development, not only in material and economic domains, but in personal development circles where the idea of a drive to transcend onwards and upwards beyond the limitations of our material reality took root (Cohen 2011). In recent years that continual drive for material progress has caused people to question the industrialised mindset at many levels. The ecological consequences of our on-going push for greater material comfort are being reflected in the growing alarm around climate change and related issues (Lovelock 2006, Lynas 2007, Rischard 2002). In self-development circles, people are realising that the expansion of our consciousness has to go hand in hand with a deepening relationship both to our body and the resolution and release ofpast traumas that may be withholding energy from our further development (Wilber 2000) and keeping us locked in fear-based patterns of behaviour (Currivan 2011). As wisdom traditions point out, inner and outer worlds reflect each other (Lao Tzu, Mitchell trans.1999). Current linear ways of understanding the life process in science and cultural studies are inadequate to embracing and engaging the ecological and societal interrelationships and complexity of the issues that humanity is currently facing worldwide (Laszlo 2001, Wheatley 1999). The combination of these challenges is forcing humanity to seek out new ways of understanding ourselves, the world and life itself. Linear developmental thinking does not accurately reflect the latest findings from the frontiers ofscience, for example (Laszlo & Currivan 2008, Currivan 2017). Yet in our predominant worldviews of our own individual and collective development, a linear way of thinking persists (Beck & Cowan 1996, Wilber 1996, 2000). That linear developmental paradigm moves by definition away from earlier levels of development that relate to our physical and instinctive stages to more complex, abstract and refined stages. The implication in the paradigm itself is that the goal and greater value lies in the later stages, de-valuing the earlier stages upon which the later stages actually rest. However, a simplistic return to pre-modern living also fails to honour the journey we have all made together so far (Wilber 1996). My quest therefore in this dissertation is to identify a way of seeing ourselves, our world and the life process itself so that our deep precognitive felt sense of relationship can be integrated with the dynamic holographic self-organising worldview that the new sciences are describing to us, while honouring the various insights that have been revealed to us along the way. In seeing ourselves and the wider world through this lens, I believe we will naturally start to act and be in ways that are in greater alignment with the life process itself, and therefore increase the chances of humanity playing a constructive co-creative role with all the forms of life that are part of our worlds. I have yet to find anyone who has made a contribution from this perspective to the fields of human and cultural development. In doing this I will add a new way of seeing ourselves to the field that is more adequate to the dynamic interrelatedness of the world we live in. The first domain includes literature that demonstrates the need for new thinking and practice that reflects a greater sense of dynamic interrelationship. It covers the ecological challenges that our current thinking and practice has contributed to (e.g. Gladwell 2002, Laszlo 2001, Lovelock 2006, Lynas 2007, McIntosh 2008, Rischard 2002) as well as broader analyses from a anthropological, societal, psychological and philosophical perspective (e.g. Baring 2013, Calleman 2004, Grof 2012, Leviton 2007, Lippe & Schouten 2010, Macy 1998, Stewart 2000, Wilber 1996 & 2003). The second domain explores approaches that have emphasised thinking and practice from an assumption of wholeness and inter-relatedness. This includes writing that has been broadly categorised as integral thinking (e.g. Beck & Cowan 1996, Bloom 2000, Graves 2002, Merry 2009, Whitehead 1957, Wilber 2000 &2001) as well as more process-oriented publications focused on the practices that people can adopt once interconnectedness is assumed (e.g. Artress 2006, Cohen 2011, Macy 1998, McTaggart 2011, Merry 2009, Senge et al 2004, Taegel 2010, Wheatley 1999). The third domain describes material that contributes directly to the volution thesis, with references to the dynamic holographic nature of life. Some material attempts an objective description of reality (e.g. Currivan 2011, Currivan 2017, Doczi 2005, Edmondson 2009, Haramein 2013, Hardy 2008, Jahn & Dunne 2005, Kieft 2011, Laszlo 2004, Laszlo & Currivan 2008, Lefferts 2012, Nichol 2003, Roney-Dougal 2010, Sheldrake 1981, Talbot 1991, The Three Initiates 2006), whereas other material assumes that reality and describes practices that work from that assumption (e.g. Andeweg 2009 & 2011, Keen 1998, Leviton 2007, Rayne 2012, Small Wright 1997, Spangler 2010, Taegel 2012). Together, this review provides the foundation for the volution thesis. The insights from the three domains of literature are woven through the dissertation to present the thesis and are not presented independent of each other. Volution is a theory that has been taking shape for me over a number of years. The basic hypothesis is that everything that is part of life is created out of a tension between a current andpotential reality that represents a vacant niche in the ecology of life. That tension, that vacuum, is what exerts a pull on the unified field (Lefferts 2012), and starts a process of giving form to the impulse that emerges out of the tension. That process, when looked at as a flow, can best be represented by the form of a torus. When looked at geometrically, it is best represented by Buckminster Fuller’s jitterbug model (Lefferts 2012), with an ongoing unfoldment and enfoldment, as information and consciousness combine holographically in energy and form. The core motion of a torus is spinning and pulsing, which is why the term “volution” is so apt to describe it - “1. a rolling or revolving motion. 2. a spiral turn. 3. a whorl of a spiral shell” (Merriam-Webster online dictionary). “Volution” is also at the core of the words “evolution” and “involution”. In searching for a name to describe the process behind those two dynamics, “volution” serves us well. The volution process itself can also be seen as a breathing process, a continual pulsing of an energetic flow of information between on the one hand subtler dimensions of life that most humans do not perceive consciously and more defined and denser dimensions of life that humans tend to be able to see with their eyes and feel with their bodies. It describes how these various states of reality - as described for example by Wilber (2001) as causal, subtle and gross - interact with each other as one dynamic whole. This process ties in closely with work that has been done describing a holographic view of reality (Currivan 2011 and 2017, Talbot 1991). This theory of life has been explored already through the lens of physics (e.g. Bekenstein 2003, Chown 2009, Haramein 2013, Susskind 1995). Given the fundamental nature of this perspective, my interest is to explore how it relates to human culture and society. My thesis is that volution provides a way of looking at ourselves that can integrate a developmental evolutionary perspective with an understanding of how we are related to all other aspects of life, in both time and space. This is what makes it “trans-linear”. My thesis is that a holographic, fractal and trans-linear perspective can successfully be applied to human and cultural development. This will be achieved through an original philosophical argument and include a comprehensive literature review, as well as reflections on my own experience in personal practice and organizational development, providing a research basis and contextual framework for the concept of volution. The research combines three main existing research approaches. The first is Philosophical Inquiry, in which one goes in search of the most fundamental answer to a question. Each step of the way I am looking for the pattern that I can identify that lies behind the other patterns that I can see. In this approach, I map out different expressions of a volutionary perspective, review them and contemplate the pattern that connects them. The second is the Grounded Theory method, which identifies patterns across existing data points, codifies and categorises them, and is able to draw meta-conclusions connected to and grounded in the diversity of original findings. This enabled me to review the array of ideas and theories related to volution, identify the patterns across these, and allow an overarching picture to emerge. Seeing patterns in this way across different contexts enabled me to build the case for the holographic nature of life. The third is Organic Inquiry (Clements, Ettling, Jenett, & Shields 1998), which emphasizes the importance of the individual’s interior experience and inquiry as a source of knowledge and insight. Many of the insights I have gained so far about volution have emerged from contemplation of thoughts I encounter and experiences I have had through my own personal development and systemic energy practices. Organic Inquiry offers a framework to be able to include my inner experiences in my research process. I applied this by reviewing my journal entry notes around my personal practices and continuing to develop an awareness during my practices of how my experiences relate to the volution theory. 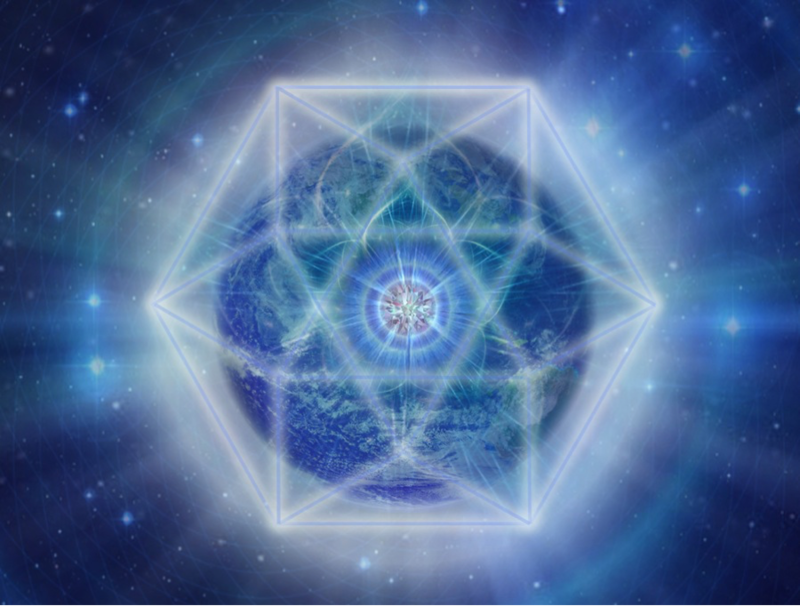 Seeing these patterns in me and connecting them to patterns around me helped to establish the argument for a holographic perspective on reality. The research process primarily included a literature review together with an exploration of patterns in the world around me and in my interior experience. Organic Inquiry supports the experiential research, with Grounded Theory enabling the categorisation of insights and the identification of patterns that connect. Philosophical Inquiry enables me to contemplate what is emerging and discover the most fundamental level of reality accessible to me.